The honey in our region is chiefly derived from nectar flows in the spring. It usually consists of Tulip Poplar, Black Locust, Redbud, and numerous other nectars from trees and wildflowers. This spring honey is usually a reddish color, unless it is predominantly Black Locust, which is very light with a delicate flavor. During the summer we often have a dearth with it's usual absence of nectar, though some years we may be lucky enough to get rain, and therefore ground moisture, that will sustain some wildflowers. In late summer and early fall, if the weather and moisture levels are conducive, we can get some goldenrod, wingstem, aster, and knapweed honey. 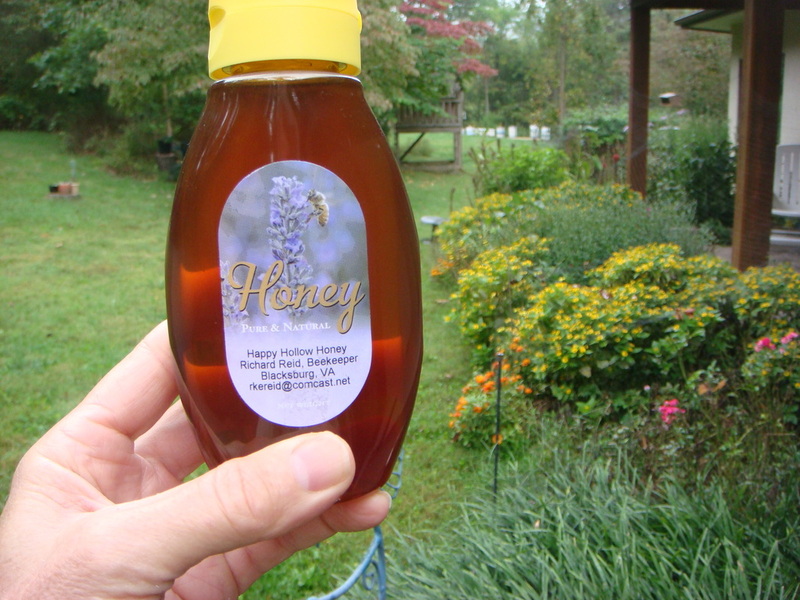 The later summer/fall honeys are usually lighter in color. If your honey crystallizes and you would like to liquefy it, put the bottle in a pan of warm water no higher than 110 F. for several hours. Many people enjoy crystallized honey as it is spreadable. We extract our honey at room temperature using a centrifugal extractor that spins the honey out of the comb. It then flows into a clarifying tank with baffles. Before it passes each baffle, some of the wax and air settles out. The honey is then pumped to the bottling tanks where any remaining fine wax particles and air bubbles rise to the top. The honey is bottled by hand straight out of these tanks through a valve at the bottom. Our Honey is sold at Blacksburg (formerly Heavener) Hardware, Eats Natural Foods, Akke's Yoga Place, Annie Kay's Main St Market, Glade Road Growing (on the farm), and Smithfield Plantation in Blacksburg, VA.